Back before it was broiled, scalloped, or étouffée’d, there was only one way you got your seafood: golden brown, crispy, and piled high. And back before fresh fish found its way to grocery stores inland, there was only one way to get it: You had to go to the beach. Must have been nice growing up so close to the ocean. So many people have said that phrase to me over the years. But the truth is, we didn’t get down there all that much. In Clinton, where I grew up in the days before Interstate 40, summer was tobacco time. The produce market over in Faison was in full bloom; there was money to be made, and ours was a seasonal economy. Even though you could leave town and be in sight of sandbar and sea oats in just more than an hour, I am sure plenty of folks in Clinton were far more familiar with Hamilton Beach, the factory out on U.S. Highway 701 where they ran three shifts making blenders, than Wrightsville Beach or Topsail Island. Back then, Clinton was one of a string of eastern North Carolina towns — Garner, Smithfield, and Newton Grove if you were coming from the Triangle; Siler City, Sanford, Lillington, and Dunn if the Triad was your starting point — you passed through on the way to the beach. Clinton, back in the day, depended on beach traffic. I could walk the quarter-mile from my house down to Old U.S. Highway 421 and see on any given fair-weathered Friday or Sunday, station wagons with coolers, floats, and chaise longues roped to luggage racks lined up for gas or snacks at either Boykin’s or Roy Best’s stores, which competed for commerce from diagonal flanks down at the crossroads. Those of us who did make it down were far less likely to stretch out on a beach towel and slather ourselves up with lotion, or spend hours bodysurfing in the high afternoon tide. What drew us was not what you could do alongside or atop the ocean, but what lay beneath it. Surf casting, pier fishing, flounder gigging in the nighttime sound — the ocean was good for one thing, and that was food. No matter if you could not make it down there to harvest the bounty of the drink. Across the street from the first newspaper my father owned in Clinton, in what passed for dead center of downtown, there stood not one but a half block of fish markets. That might not sound like a lot if you are from Raleigh or Charlotte, where a city block is worthy of, well, a city. But there weren’t that many blocks in Clinton, which made it seem as if we had ourselves a fish market district. Along the plate-glass window of my father’s office was a ledge where I spent hours after school, the dingy curtains pulled back, studying the life of the street. The window framed the fish markets perfectly, so a half-hour’s perch behind it was like watching a documentary feature on fishmongers. The doors to the markets seemed to be propped open year-round, sun or cloud, rain or shine. The men who ran them were almost caricatures of fish-market men: They wore white T-shirts, crew cuts, tattoos of the Korean War variety, which is to say crude and usually lewd; their aprons were stained with blood and guts. They smoked with their mouths, rarely their hands. Always was there a crush of ice melting on the sidewalk or in the gutter. The ice was not white of ice; it was dirty. The place stank. I could almost smell it through the plate glass. The stock you found in our fish markets was not anything like you might find today in any of our upscale grocery stores. 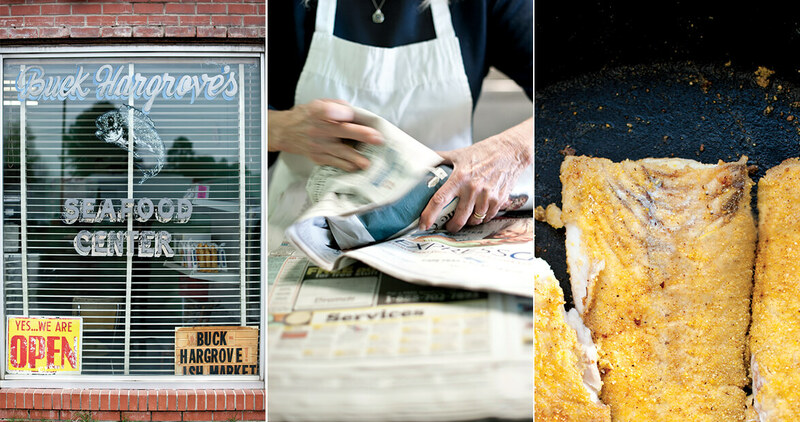 These places sold mostly what we called “trash fish” — spot, mullet, croaker — the stuff of church or civic club fish fries, of back-roads fish camps. Growing up, I never knew you could broil fish, or, good Lord, put it on a grill. The first time I ever heard the term “blackened,” I thought, “Hell, I do that all the time, only I call it burnt.” Fish was fried. It didn’t really matter how bony it was, how short on actual flesh: what mattered was the skin, crusty and crunchy, its deliciousness dependent on a vat of oil on high boil. We didn’t have to go to the ocean for it to come to us. Seafood was a treat, but it was a part of our diet from as early on as I can remember. On Saturdays, for lunch, my father, not given during the week to domestic chores of any sort, fried flounder for the seven of us. This was when the five of us were still young enough to be corralled and contained for a common meal, but I don’t remember anyone trying to escape, as the flounder was delicious and accompanied by hush puppies, which, even if the mix was boxed, smelled equally of sea and salt water, of the Atlantic just miles away. For years, my family has rented a cottage and spent a week at the beach. My siblings fly in from Seattle, Washington; Anchorage, Alaska; Ann Arbor, Michigan; and we rendezvous at my parents’ place in Chapel Hill and caravan to Topsail or Emerald Isle. That first night, travel weary, no one wants to spend much time cooking, so we go simple: a shrimp boil, some salad. Lest you think this fare sounds meager, let me assure you I do not mean we are sated by the number of shrimp you might uncover, if lucky, in some fancy bowl of étouffée. I am talking a pound per person. Only in recent years, when we all found ourselves in our sixth decade and slightly more health conscious, was there a single shrimp to be found Tupperwared in the fridge the day after. Back in the ’80s and ’90s, I used to visit my friends Rob and Mimi Merritt down at Mimi’s family cottage at Nags Head. My most memorable trips were timed to soft-shell crab season. Late afternoon, Rob and I drove over to Colington Harbour, where a fellow kept his soft-shells in tubs in the yard. I never had one growing up and have never been all that partial to the idea of eating anything whole, not even a boiled peanut. But Rob’s soft-shell crabs were like eating the sea itself. Which brings me to oysters. In Elizabeth City, where I lived for two years in the early ’90s, there was, at the edge of town, a place that surely served more than oysters on the half shell and a certain adult beverage packaged in a patriotic-colored can. But I would not know, for that was not only the sole thing I ordered there, but also the only thing I ever saw anyone else eat. I imagine I ate enough oysters there to pave the parking lot with the shells shucked to keep me in bivalve and brine. We North Carolinians are blessed not only with many miles of beautiful and accessible coastline, but also the bounties reaped daily from our waters. If barbecue is our first culinary claim to fame, our seafood comes in close behind. And yet the seafood industry has, like farming and logging and other ways we have traditionally carved a living from the natural world, changed. In 1981, the landing for the state, a record, was 432 million pounds; by 1998, the catch was down to 180 million pounds. Increased regulations, foreign competition, and hurricanes have put many of our commercial fishermen out of business, but like so many other things in our state that we cherish not only for themselves but because they remind us of who we are, as long as there is a fish to be hooked, a clam to be raked, or a shrimp to be netted, someone will be standing by ready to fix it just how you want it.